I'm re-opening my Resparkable Vintage jewelry shop. Resparkable, oddly, wasn't a word before I named my shop. But even still, it's so obvious how to spell it AND what it means, right? That's from my personal, made-up-words, dictionary. But like I said, I bet you knew the meaning of that new word as soon as you read it. I curate vintage jewelry and handbags. I clean up and repair really cool and unique pieces so they return to their like-new, original and beautiful condition. But, when vintage jewelry is broken, or missing parts and beyond repair, I use the salvageable bits to make brand new, unique designs. I'll be re-opening my shop over at Etsy, along with getting back to posting regularly on the ResparkableVintage website. 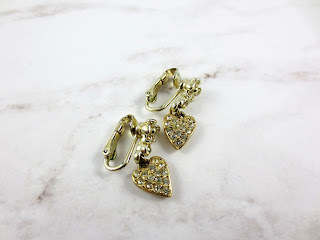 You can read about vintage jewelry designers over there, see pics of things I'm selling, seeing "before and afters" on repurposed jewelry, and more! I'll also be posting again on the Resparkable Vintage instagram feed. resparkable vintage sarah coventry earrings. looking brand new again! Congrats and good luck as you get back into it!